Oppdag fødestedet til Amerika på denne guidede tur gjennom landets mest historiske område i Philadelphia. Få en bak-scenen å se på Independence National Historical Park og mer enn 20 andre historiske steder på denne 1,25 kilometer lange trekningen, inkludert National Constitution Center, Independence Hall, Liberty Bell Center, og mange flere. Det har blitt sagt at Philadelphia er best sett til fots, så denne konstitusjonelle tursturen er den perfekte måten å utforske Amerikas fødested og de viktige stedene som har skrevet sin lange historie. Denne turen, ledet av en energisk og kunnskapsrik tour guide, gir en opplevelse som er både pedagogisk og morsom. 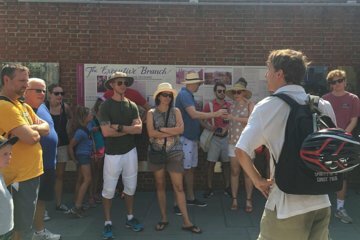 Nyt en oversikt over Independence National Historical Park-området med besøk til mer enn 20 av de mest historiske stedene i Philadelphia, som Independence Hall, Liberty Bell, Betsy Ross House, National Constitution Center, Deklarasjon, Snekkersal, Franklin Court og mange andre. Den konstitusjonelle vandringsturen i Philadelphia gir en up-close-and-personal, bak-scenen-konto over byen. Opplev historisk Philadelphia - og feire Amerikas fødested - slik det var ment å være på en sightseeingtur i livet. Denne turen opererer regn eller skinne, så kle deg for været. A most informative tour and thank you for an interesting visit to Philadelphia, a most beautiful city. knowledgeable and fun, great way to see the history unfold in a short walk. no hills! Our guide was knowledgeable and the tour was a good to start our visit to Philadelphia. He took us to important landmarks which we could later decide to go back to. This was a great experience to get an overview of the historic sites in Philadelphia. Our tour guide, Jessica, did a great job of providing us the history of the area while making the experience fun for all ages. Melissa was awesome and I would highly recommend this tour! We learned and saw so much we would have never known and seen without the tour. Well worth it! Great tour, very knowledgeable person that really enjoyed her work! There were only two of us on the tour and our guide was wonderful! We asked lots of questions and she answered them all! Our guide was awesome. We only had three on the tour so he was able to answer any question and we felt like it was a custom tour. Our Guide was awesome. He brought history to life with passion. He was extremely knowledgeable. Would recommend this valuable tour down History Lane any day. We jumped off Amtrak on our way to New York from Washington DC and had plenty of time to jump back on.